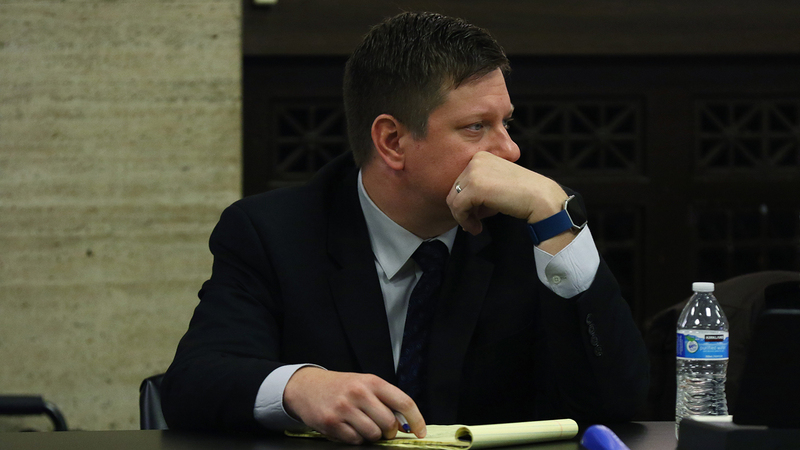 Closing arguments in the high-profile murder trial of Chicago police Officer Jason Van Dyke will begin Thursday. “Your honor, at this time, the defense rests,” Van Dyke’s lead defense attorney Daniel Herbert said shortly after jurors were brought into court Wednesday. Prosecutors then recalled one witness: Cook County Sheriff’s Officer Adam Murphy, who testified briefly before they too rested. Jurors heard from more than 40 witnesses over the past two-plus weeks, including Van Dyke himself. They will listen to closing arguments from both sides Thursday before they’re given jury instructions and begin their deliberations. Van Dyke, a white officer, is charged with first-degree murder after shooting black teenager Laquan McDonald 16 times during a police call in October 2014. He also faces 16 counts of aggravated battery and one count of official misconduct. His attorneys have argued he acted in self-defense and the shooting was justified. Murphy previously testified as a prosecution witness during the first week of the trial, saying he followed Chicago officers from Cicero Avenue to the scene of the shooting and heard McDonald “gasping for air and gurgling” after he’d been shot. On Wednesday, Murphy testified he saw blood flowing from McDonald’s body, and reiterated that he had planned to – but ultimately did not – give McDonald CPR at the scene. Cook County Sheriff’s officers are trained to render aid to gunshot victims if they can. On cross-examination, Herbert informed jurors that Chicago police officers are actually instructed not to give aid because they are not trained medical professionals. Before resting, the defense also introduced into evidence a police squad vehicle tire that McDonald popped with his knife in the minutes before he was killed. Van Dyke took the witness stand Tuesday, tearfully explaining how he fired only after McDonald raised a knife at him, and then continued firing to try and shoot the knife out of the teen’s hand once he had fallen to the ground. Special prosecutor Jody Gleason pointed out that the movements Van Dyke described could not be seen on the infamous dashcam video of the shooting, but Van Dyke maintained that footage did not show things from his perspective. With deliberations set to begin Thursday, it's possible a verdict could be reached by the end of the week. Get complete coverage of the trial here.